Becoming Me is Jo-Anne's second non-fiction work. To order Becoming Me, please click here. To purchase the e-book version for Kindle on Amazon, please click here. To read endorsements, reviews and readers' comments, please click here. ​To listen to or read Jo-Anne's recent radio interview about ​​Becoming Me ​with Katrina Roe on Hope FM103.2, please click here. I began exploring the idea behind this second non-fiction book of mine in 2013, then wrote most of the original version during 2014. I sensed God was in the project and sent it off to my publisher in January 2015, yet one key, nagging question remained. Should it really be published? It is a very personal book, after all—it contains many honest reflections on my own journey of discovering who God created me to be and of removing the layers covering my true self. Besides, I had already written six published novels and a memoir, Soul Friend. Should I call it a day? I was also very tired, so decided to give myself a semi-sabbatical during 2015. At times, I tried to polish up Becoming Me, while waiting to hear back from my publisher, but those nagging doubts remained. Had I heard God wrongly? Did I have the energy to see this project through? Then, in January this year, my publisher suggested I remove the reflection questions from the end of each chapter. I resubmitted, but to no avail. My book was simply not the type of non-fiction my publisher now produced—and I understood and respected that. So what to do? Should I consider self-publishing? For various reasons, I had always resisted this idea. Then, one Sunday morning in early May, three things happened in quick succession. The first was a simple, mundane event—I picked up a nail file on my desk and, for the first time in months, noticed the image of a Russian babushka doll, so intrinsic to my story, on the end of it. A friend had given it to me, after she heard about the concept behind Becoming Me, as an encouragement and a reminder to complete the book. I came home and discovered an email from a dear friend. She had felt prompted to share John 1:12 from ‘The Message’ with me. It read: Whoever did want him, who believed he was who he claimed and would do what he said, HE MADE TO BE THEIR TRUE SELVES, their child-of-God selves ... She had capitalised the words ‘He made to be their true selves’--without knowing this was the main theme of my new book! That week, I began to set in motion the whole self-publishing process, asking others to design the cover and complete the layout for me. And at last, in October 2016, Becoming Me: Finding my true self in God will be released! I hope and pray my readers will take time to listen to God and reflect on their own life journeys as they read about mine. And, as they do, I hope and pray they will experience God’s deep love and acceptance in a fresh and freeing way and be empowered, in turn, to become all God created them to be in this world. Soul Friend is Jo-Anne's first non-fiction work. To order 'Soul Friend' click here. To read endorsements, reviews and readers' comments click here. I ran the idea by Joy and at first, she seemed a little tentative. However, the concept remained in my mind, so I checked back over my journals of the past fifteen years in which Joy and I had been meeting together. Yes, I had written down quite a lot about our conversations in that time, as well as reflections on the various quotations and books Joy had given me to read or recommended to me. Eventually, when I was convinced it was right for me to go ahead, I brought the topic up again with Joy and she seemed happy for me to continue. Months of searching through my journals followed, as I relived each event in my life recorded there and the way Joy had stood by me in these times, but slowly the book took shape. However, in the process of completing it, I began to suffer severe lower back pain and sciatica in my right leg. Many days, I would lie on my side, typing on my laptop which I had placed on a chair beside the bed. Then not long after I began editing the draft copy of the book, Joy lent me a set of four DVDs she and her husband David had made which recorded their own journeys in life and in ministry. These gave me further valuable insights into Joy’s background and life experience which I then incorporated into the book and helped me understand why she had said many of the things she had to me over the years. I thank her sincerely for the loan of this valuable resource. 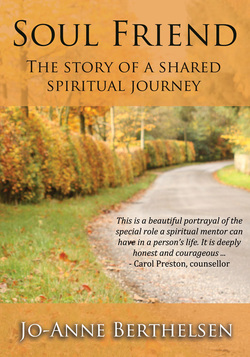 Apart from wanting to honour Joy and acknowledge the key role she has played in my spiritual journey, I had three main purposes in mind when writing Soul Friend. Firstly, I hoped to inspire others to seek out a spiritual friend for themselves. Secondly, I wanted to challenge mature Christians to offer to walk beside others in their spiritual journey, as Joy has for me, and to be prepared to undertake any training available in this area. And thirdly, by being very open and honest about my own struggles, I hoped to encourage others going through similar challenges in their own lives. I trust I have succeeded in fulfilling these aims. I pray with all my heart that those longing for someone to walk beside them in their spiritual journey will have that desire fulfilled. I pray many more spiritual mentors or spiritual friends will step out as a result and walk beside others as they seek to grow in God. And I also pray that in some small way, my book Soul Friend will bring comfort, healing and great encouragement to all who read it. And of course my dear friends Joy and Alison. Listen to my interview with Leigh Hatcher. Broadcast Sunday evening 18/11/12.